In many places, the existing layout of roads and buildings means that there is simply not enough space to provide segregated cycle lanes without adversely impacting other users. One of my biggest problems with the attitude towards cycling in London is that it is all too frequently seen as something ‘extra’ that has to be accommodated alongside motor traffic and pedestrians; the reference to ‘other users’ in this statement from the Mayor suggested that ‘cyclists’ are another group of road users that have to somehow be fitted in to the existing streetscape. There did not seem to be the recognition that creating safe, comfortable and direct space for bicycle use was an effective way of reducing the demand on the road network. Make the bicycle a suitable alternative, for all, for those short car trips – to school, to shops or to work – and you massively improve the capacity of London’s roads for all users, as well as making them substantially better places. A car user could become a bicycle user, rather than a bicycle user being fitted in at the margins alongside car users. and in doing so apparently forgetting that bicycles are a mode of traffic, and one that can improve the flow of traffic for all users. So, while I think we should wait for more detail about last week’s announcement actually entails before passing serious comment (about which more below), I am very pleased to say that, if the Vision for Cycling in London [pdf] accurately reflects the opinions of the Mayor and those with responsibility at Transport for London, then, if nothing else, the language and the attitude has changed. I have been critical of both Boris Johnson and Transport for London for their failure to come out with the right language and attitude, so it is only fair to acknowledge when they say the right things, even if they haven’t started to deliver yet. The most exciting thing for me about the Vision document is the recognition that the bicycle is a solution to London’s transport problems; instead of having to ‘accommodate’ cycling on main roads with half measures like blue paint, the Vision recognises that, done properly, with a continental-style approach, cycling infrastructure makes life better for everyone. Instead of claiming that putting in bicycle infrastructure will ‘impede the flow of traffic’, the Mayor and TfL are now suggesting precisely the opposite, that proper bicycle provision will help the flow of traffic. Even right before last year’s election – in what was fairly universally accepted as a disastrous performance on the subject of cycling – Boris was pitting ‘cyclists’ against ‘motorists’, presenting the former group as slightly weird environmentalists who ‘want to ban cars’, and who think they are ‘morally superior’. All this in front of an audience composed mostly of serious journalists wearing suits, who happen to ride bikes in London. On the basis of that performance and what it implied, I said that Boris would probably be a ‘disaster’ for cycling in London. Of course, nothing has been delivered yet, but if we consider merely the attitude exhibited in the Mayor’s new Vision document, I have to say that I misjudged Boris. He and his advisors have listened, and responded in a serious manner, and taken on board the criticism. I’m determined to turn London into a cyclised city – a civilised city where people can ride their bikes safely and easily in a pleasant environment. But that document was very short on detail of how that ‘pleasant environment’ might be achieved, talking mostly about ‘encouragement’ and getting people to obey the rules of the road. I think it is correct to describe the new Vision document as a ‘step change’ from that approach, because it engages much more seriously with the Dutch and Danish method of catering for cycling, something that London Cycling Campaign have very successfully been demanding, along with the Cycling Embassy of Great Britain, and other campaigners and bloggers. The focus, throughout the document, is on making cycling a pleasant thing to do; while the Vision is not especially clear about how this might be achieved in practice, the shift in approach, particularly from the initial Superhighways (which were about ‘routefinding’ and making drivers ‘more aware’ that they might encounter cyclists), is remarkable. As I have already said, the Vision recognises that cycling is a solution to London’s transport problems, not something that needs to be fitted in alongside existing modes. My impression is that TfL have known this themselves for a long time; Peter Hendy writes in his foreword about the pressure of population growth and their inability to build new roads, or to widen existing ones, to deal with that growth. They have reached the limit of accommodating private motor traffic on the existing road network, and something had to change. at the very heart of this strategy is my belief that helping cycling will not just help cyclists. It will create better places for everyone. It means less traffic, more trees, more places to sit and eat a sandwich. It means new life, new vitality and lower crime on underused streets. It means more seats on the Tube, less competition for a parking place and fewer cars in front of yours at the lights. Just as importantly, the document recognises that this fundamental shift away from motor traffic, necessary to relieve demand on the network and to make life better for all users, will not happen in significant numbers without a change of approach. Namely, the Going Dutch that London Cycling Campaign and others have been demanding, focusing on the needs and requirements of that vast majority of the population who do not feel comfortable cycling with motor traffic. 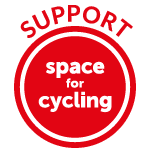 we must now greatly increase our provision for cyclists – and, above all, for the huge numbers of Londoners who would like to cycle, but presently feel unable to. I want [cycling] to be something you feel comfortable doing in your ordinary clothes… I want more of the kind of cyclists you see in Holland, going at a leisurely pace on often clunky steeds. As many have commented, this is something that could be lifted straight of the Cycling Embassy’s manifesto, or from the London Cycling Campaign’s Go Dutch agenda. 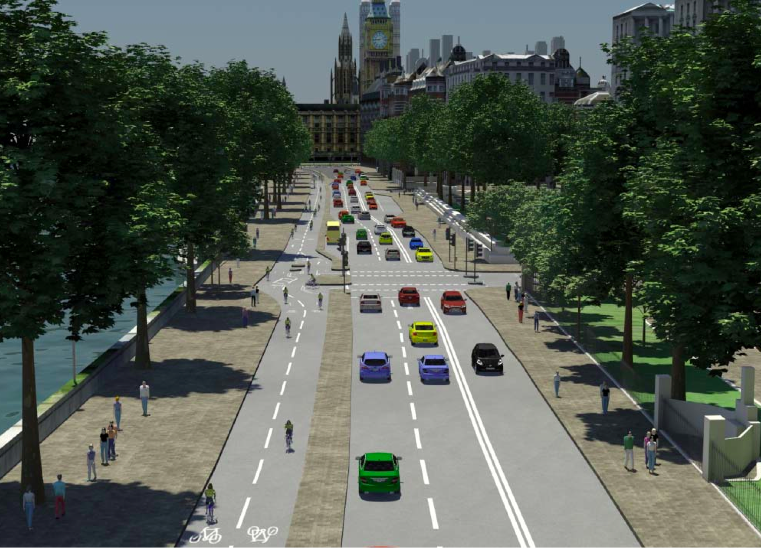 There will be more Dutch-style, fully-segregated lanes and junctions; more mandatory cycle lanes, semi-segregated from general traffic; and a network of direct back-street Quietways, with segregation and junction improvements over the hard parts. This is addressing, head on, the central issue that prevents most people from cycling; perception of safety, and fear of motor traffic. Where there is conflict between modes (which there often isn’t) we will try to make a clear choice, not an unsatisfactory compromise. We will segregate where possible, though elsewhere we will seek other ways to deliver safe and attractive cycle routes. Timid, half-hearted improvements are out – we will do things at least adequately, or not at all. Separating cyclists from motor traffic is now the stated priority of Transport for London; whether this actually happens or not, the language is remarkable. Even where ‘full’ segregation might not be possible, the Vision suggests ‘semi-segregation’, using mandatory lanes where cyclists are kept separate from traffic by rumble strips or ‘ridges’. The issue, of course, is whether this will actually happen, and whether the fine words about reclaiming space and not fitting in cycling around the margins will amount to anything once actual conflict for space emerges. I am cynical, but I’m prepared to withhold judgement until these issues actually arise. The scheme to separate cyclists from motor traffic along Stratford High Street is a promising early signal that the willingness is there. So we should wait and see. My principal concern is actually junctions. The junction review currently being undertaken by TfL is – with the exception of the decision to test something ‘Dutch’ for possible approval at Lambeth Bridge north – very half-hearted and weak. The current TfL strategy of ASLs and ‘early start lights’ (as currently in operation at Bow roundabout), while well-meaning, is not good enough, certainly not as good enough as full separation of modes, and the full removal of turning conflicts. Yet this seems to be the only intervention in their toolbox at present, and there is no detail in the Vision about any other potential designs. This is something that is going to have to be addressed. The cover of the Vision shows cycle tracks approaching the Houses of Parliament, and Westminster Bridge. Not timid ASLs that you are not permitted to enter while motor traffic is flowing, and that merely let you depart a few seconds earlier. So I hope that Transport for London are willing to adapt, and to learn how these Dutch junction designs work. 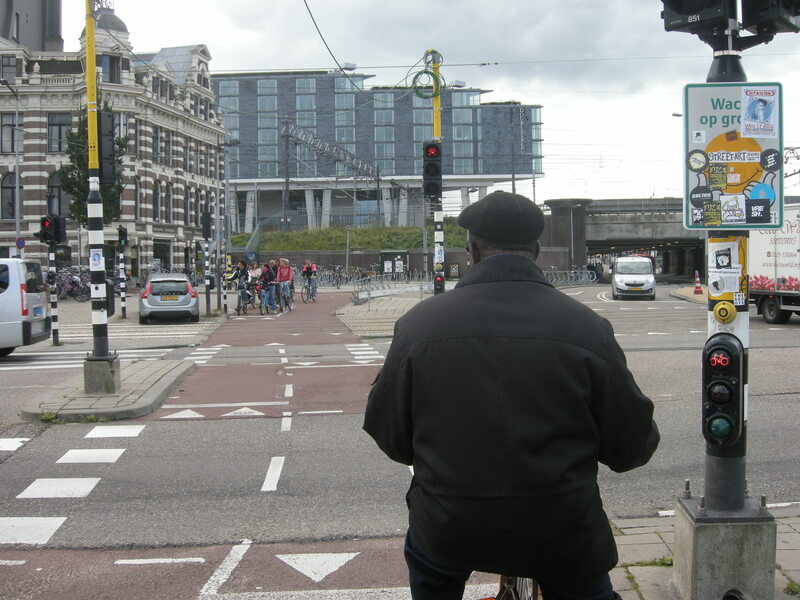 Rather than going to Paris (which with the best will in the world is not brilliant for cycling, and certainly does not cater anywhere near as well for cyclists at junctions as Dutch cities do) why not book a trip to the Netherlands? Take a look around for yourself, and then let David Hembrow fill you in. The language of the new strategy is very welcome, but the approach has to match it. This entry was posted in Boris Johnson, Bow Roundabout, Car dependence, Cycling Embassy Of Great Britain, Cycling policy, Go Dutch, Infrastructure, Junction Review, LCC, London, Safety, Subjective safety, The Netherlands, Transport for London. Bookmark the permalink. 6 Responses to The language has changed – will the strategy match it? I was very encouraged to hear they are experimenting with Dutch style junctions in their transport Labs at the All Party Enquiry last week. We need to get all the Highways Engineers to spend a week cycling round Den Haag, Amsterdam and Utrecht, from the routes next to the motorways and dual carriageways to the narrow medieval streets in the middle. Unless these designers and builders get to use it first hand, we won’t get very far, I feel. I can’t help wanting to remind them of all the teenagers and disabled people who could use proper provision too. Not just the language, the whole thinking has to change, from ‘lots of car movements are good for the city’ to ‘traffic with the lowest impact on the city itself must have the highest preference’. i.e. Going from cars and heavy transport as the main thing to promote, to pedestrianization first, then cycling, then public transport, etc etc. It will prove to be the only way to make a city a place to live in, not a place to get cars moved about. Yes, TfL & Boris have certainly changed their tune and that is to be heartily welcomed. It’s taken 15 years to get here. Yes, LCC & others will have to work very hard to ensure effective solutions. This will require a step change in the capabilities and conceptual outlook of TfL’s engineers. So a prime objective should be to get TfL to suppress its ego and appoint a top man or woman engineer from the Netherlands or with similar practical experience. They did it for the tube, so if cycling is now as much a valid component of transport strategy as that mode, then they shouldn’t hesitate to bring in the necessary experience given the lack of experience and the near universally inadequate quality of cycling facilities in the UK. Effective design is an absolute necessity for success. Would we trust someone who has never been on a train to manage the tube network? It’s great to see senior political voices, Conservative voices, even non cycling voices finally giving backing to the Everybody Wins argument. Until now it could be dismissed as a special interest group speaking only for themselves. We knew it made wider sense of course, but it’s not always easy to convince others. When people like Boris Johnson, Isabel Dedring & Peter Hendy are prepared to stand behind it – “more seats on the Tube, less competition for a parking place and fewer cars in front of yours at the lights” – it becomes difficult to dismiss the rational economic & social argument in favour of much higher levels of cycling, even if you’re one of those people who’ll never get on a bike yourself.